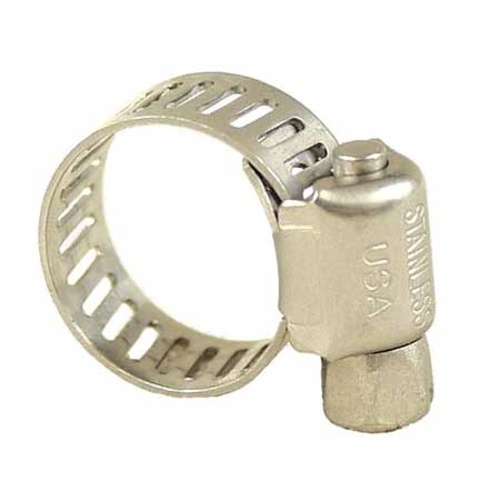 These Stainless Steel hose clamps are perfect to keep around as your go-to clamp. Use them anywhere you want to be sure your tubing will stay connected. They are perfect for silicone hoses and hooking up quick disconnects, pumps, or on any system that may need a tight seal. These stainless clamps tighten up better than cheaper ones, and the stainless steel won’t corrode. It’s handy to keep a few spares around, just in case. Stainless steel hose clamp will fit hoses with 3/8" through 7/8" OD. I need some clamps for tubing. suggested by web site; I overlooked that I would need one! Thanks! The clamps function like you expect (use a 1/4" socket driver), however I noticed that my magnetic bit tip, was able to hold clamp in mid air - from anywhere on the clamp! I suspect these are a lower grade ferritic stainless that may actually corrode. Austenitic (304,316,etc) stainless doesn't (normally) have magnetic properties and is less likely to corrode in our brewing environment. I used em anyways. I noticed that on 1/2" tube they have about a 1/4" tab remaining once tightened down. The edges are not sharp like other clamps and the rounded corners on the tab, thankfully don't cut soggy hands. Work as designed. Only shortcoming is that they can sometimes strip if you crank them with the wrong size bit, but that only happened to me once out of 20x. Worth the money. Great quality. Works great - not sure the material, but haven't had corrosion on mine. Cheaper than the hardware store! More Beer Rocks! These clamps are cheaper than the hardware store or even Amazon! Work well at clamping tubing to quick connects. I purchased these to clamp my quick connects to the tubing for my transfer hoses. I was happy to see that they are stainless steel and not coated clamps. They are a bit spendy, but saving me time by not having to locate the clamps elsewhere, made them worth it. Given all the liquids and moisture involved in homebrewing, these clamps are always corroding for me. They must not be made out of stainless or any kind of galvanized metal (can't tell from the description). These hose clamps are long lasting, albeit a bit pricey. These are cheaper than I could find locally?